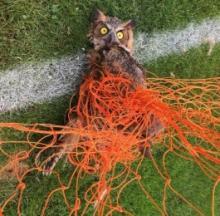 Soccer may be 'the beautiful game' but the sport's increasing popularity is making life ugly for nocturnal wildlife trapped in the tough webbing of unoccupied goal nets. "One if by land, two if by sea!" Coined by Longfellow, in his poem about the iconic ride of Paul Revere, the warning referenced how many more British troops could attack by sea versus land. Coincidentally enough, in the natural world it appears that the Loggerhead sea turtles outnumber the Galápagos land tortoises.